The abandoned Crosley Building in Camp Washington. In the past 20 years, the Crosley Building has gone from just another example of the architectural style of Samuel Hannaford & Sons to one of the most recognizable works of local taggers. 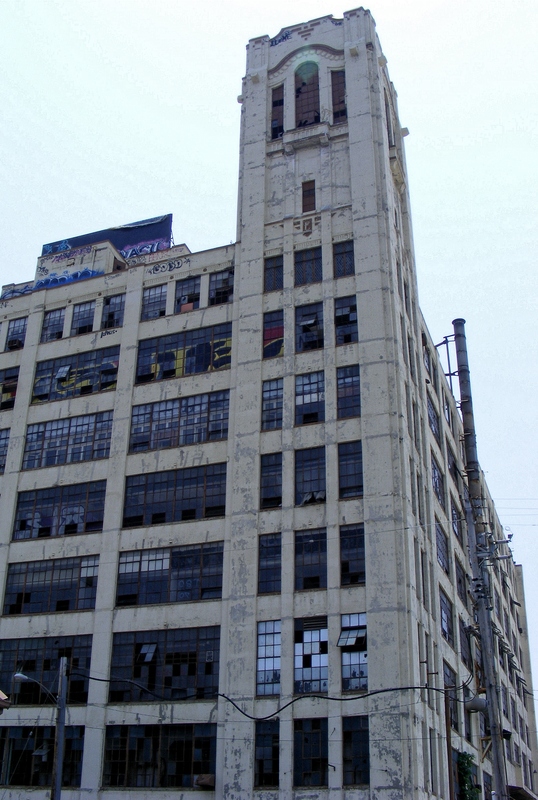 The taggers may scoff, preferring to call themselves “graffiti artists,” but it is ironic that one of Cincinnati’s most important remnants of its industrial past should become such blight. The building was the headquarters of the Crosley Radio Corp., the empire begun by Powel Crosley, inventor of the first mass-produced electric tabletop radios, non-electric refrigerators and electric automobiles. Built in 1929, the 10-story, 330,000-square foot building in Camp Washington is typical of large industrial buildings of the early 1900s, with concrete columns that fan out at the top and Art Deco detailing in the tower. A second-floor bridge connected the main building and the warehouse. The flood of 1937 sparked a fire in the Mill Creek Valley that destroyed assembly Building K, the refrigerator assembly building, at the Crosley plant and a warehouse at the Standard Oil Co. According to the Quarterly of the National Fire Protection Association, (Vol. 30, Issue 4), the fire began on the morning of Sunday, January 24, when escaped flammable liquids on the flood waters ignited, sparking a blaze that burned for 21 hours at the three-story, supposedly fire-resistive warehouse at Standard Oil. Even so, the fire left less lasting damage to the integrity of this historic landmark. 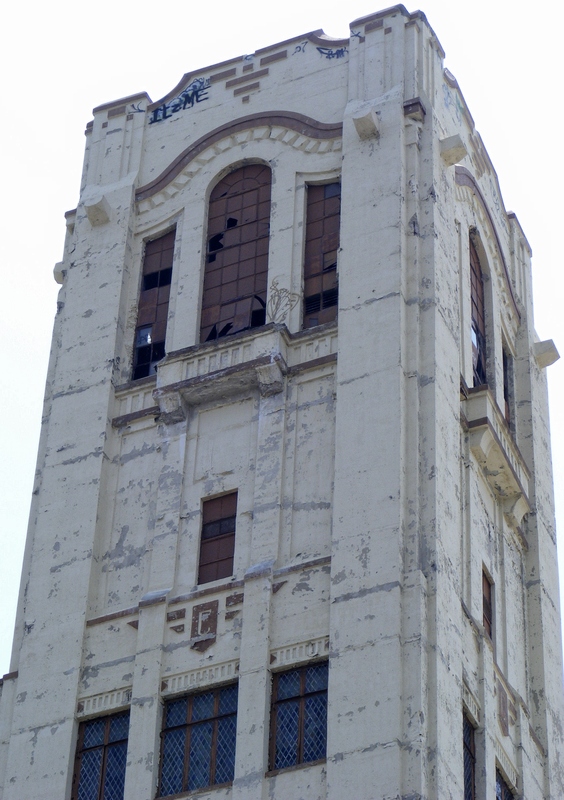 The tower of the Crosley Building. Note the "C" at the bottom middle of the image. The Crosley Corp. sold the building in the 1970s, and various owners and tenants occupied it through the 1980s. Most recently it has been used for printing, offices and storage. 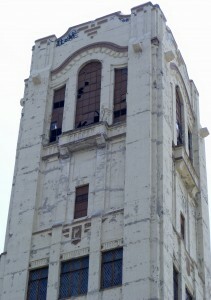 It is currently owned by the Hosea Worldwide Co., which has let it slip into disrepair. The city of Cincinnati planned to redevelop the site for use as a technical/research facility, but recently reinvented the plan with the private market in mind. Sam Stephens, senior development officer with the Department of Community Development, says “he would really have to sit down with the private market to figure out the redevelopment of the site.” The city is asking for $4.3 million in stimulus dollars to redevelop the Crosley Building, and is seriously looking at redeveloping the site, given the fact that the building is close to rail, downtown, the airport and I-75. Although an environmental remediation would probably be necessary, there is the possibility of federal funding and grants available from the Clean Ohio Act and the Job Ready Sites programs. The city is working with the Camp Washington Community Council, which expects to finalize an urban renewal plan for the neighborhood this summer. The Planning Commission and City Council would be next in the plan to redevelop the building. Possibilities exist for a residential/retail development at the Crosley Building, similar to the planned American Can Factory Square complex in the old American Building on Spring Grove in Northside. Both sites are close to the path of the Mill Creek Restoration Project, a 13.5-mile long planned public green space. The combination of residential, retail and green space, along with pedestrian walkways and bike paths, could create a unique corridor with the potential for jobs and business opportunities.